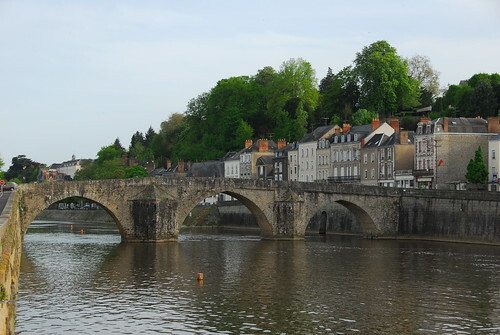 There are many lovely green way bicycle routes in Pays-de-la-Loire – Mark Cramer cycles the voie verte from Laval to Renazé in the Mayenne department. Voies vertes (literally, “green ways”) are found in most regions of France. They are primarily bicycle paths, sometimes shared with pedestrians, occasionally with horseback riders. Many of these voies vertes are reinventions of discontinued railroad lines, meaning that they are relatively flat and lined with the type of wooded areas that typify train-track landscaping. Some go along canal tow paths while a few occupy old logging roads. The Pays-de-la-Loire region is home to some of the loveliest voies vertes in France. Even at midday, the 46.5km voie verte from Laval to Renazé keeps you protected from the sun. The Tour de France peloton will never pass through here, since the compact dirt is only wide enough for two cyclists. Once in awhile, there’s a slightly loose patch of sand, but otherwise it’s nearly as smooth as the asphalt you find on most voies vertes. Nor will many tourists pass through here, since it’s outside the psychic confines of tourism. You’re rolling through the Mayenne department in Pays-de-la-Loire, but beyond the Loire castle circuit. Alan (a riding friend) and I made this voie verte part of a larger circuit that eventually got us to the castles in Saumur and Villandry. We had arrived in Laval by train from Paris. Rest assured, this voie verte is safe. Slow-down barriers at intersections prevent you from speeding across country roads while attractive stone kilometre markers, painted yellow and blue, make it impossible to get lost. Despite the safety amenities, one-of-a-kind surprises lurk along the way. Highlights of Laval include an old castle, a colourful art naïf museum, the Middle Age Basilica called Notre-Dame-d’Avesnières, narrow medieval streets lined with exposed-timber-framed houses, and river cruises. The voie verte begins about 3km to the west of Laval, just before you enter a suburb called St-Berthevin. From the road, we walked the bikes below a viaduct to the voie verte and rolled past the 1794 cave refuge of the insurgent Jean Chouan, skirting the Concise Forest. Peaking through the woods, we caught glimpses of sprawling farmland. Though this was the beginning of summer vacation, few cyclists passed us. Rabbits crossed the path in pairs, sensing no threat from the traffic. About a third of the way, just past a picnic bench and an intersection leading to Cossé-le-Vivien, we noted a sign for the Musée Robert Tatin. Folks from the slow bicycle movement would have admired us for not squandering a chance to stop. Robert Tatin was a French version of Barcelona’s Gaudi. Tatin’s museum acreage gave him free and playful reign to experiment with sculpture, mosaics, murals, and painting, as was the case for Gaudi in Park Guëll. The fact that Tatin chose not to live in Paris explains his relative anonymity. Energised by Tatin’s grainy flightfulness, we were once again on our way. We did have a hotel reservation in the town of Pouncé, about 15km beyond the end of the voie verte, so there was some incentive to limit the stops. About two-thirds of the way to the end of the voie verte, we arrived at a country race track at Craon. Bad timing: no horse racing that day. Each year, at the end of August, the beginning of September, and then late September, Craon stages eight racing days, mixing thoroughbred, steeplechase and trot racing. The town of Craon swells during these days, like Saratoga in August. We stopped for coffee at a bar, where a soccer mum bartender told us about the Craon castle, aptly called “petit Versailles”, as well as Ferme du Pressoir, a family-run apple cider cellar, open to the public, with home-made cider, apple brandy, apple chips, and apple [you fill in the blank]. Eventually we reached the end of the voie verte at Renazé. Usually the D roads (“d” for departmental) are relatively free of traffic and ideal for cycling, following the curvature of the land and respecting farm boundaries even if means slaloming through. However, the big-D road to Pouancé was a thick straight line on my contour map, so we knew we’d be up against the truck traffic. We chose the smaller D212 and D180, through rolling farmland, arriving in Pouancé in time to have dinner at the gate of the imposing medieval fortress castle, built between the 12th and 15th centuries, and surviving the sieges of the Hundred Years’ War. Many voies vertes end at no particular final destination, so the voies vertes are best used as segments of larger trips. Between voies vertes, bucolic “D” roads, canal tow paths, and more standard bicycle paths, you can map out your own tour de France. Many companies offer organised rides in Pays de la Loire. They usually inlcude accommodation, detailed route notes and maps and on-ground support and advice. Most rides are self-guided and follow established cycle routes and quieter back roads. Self-guided rides offer a mix of independence and local support. Bike hire can also be arranged by most tour companies. You can search our organised tours section here. See our bike hire listings for bike rental options in Pays-de-la-Loire. For accommodation options, see our Where to stay section. On the guidebook front, see John Higginson's Cycling the River Loire: The Way of St Martin, published by Cicerone. For more general tourist information on the Loire, see the DK travel guide to the Loire, the Loire Valley Footprint guide, or the Cadogan equivalent. The Loire à Vélo route is the best known of Loire's cycleways and it's largely on green way routes. It covers 800-odd kilometres from Cuffy (near Nevers) to Saint-Brevin-les-Pins (opposite Saint-Nazaire), and crosses both the Centre and Pays de la Loire regions. The cycle route runs mostly along the Loire River, and forms the western end of EuroVelo 6. It has local offshoot routes that cover key chateaux, Blois and much more.